Cut tofu into half inch thick squares. Fry in high heat until crispy and golden brown. Set aside. In a pan heat a little oil then sauté garlic until light brown. Add sesame seeds, button mushrooms and shitake mushrooms. Sauté for 2-4mins. Add salt to taste. Transfer to a small clean bowl/saucer. Set aside. In the same pan sauté bok choy in high heat until leaves turn dark green. Add salt. Set aside. Using the same pan again, sauté ginger strips in a little oil. Add soy sauce, sugar, water. Mix and simmer. Slowly pour the diluted corn starch. Mix continuously. Put enough diluted corn starch until sauce reaches desired consistency. In a platter arrange cooked Chinese white cabbage or bok choy in one layer. 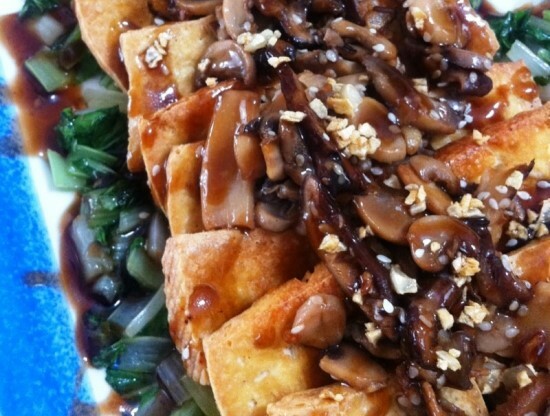 Put crispy tofu over Chinese white cabbage or bok choy then top tofu layer with the garlic mushroom. Drizzle sauce on top and sprinkle with the toasted garlic.